Cut the tough bottom of the Brussels Sprouts, remove outer leaves and clean any impurities. If needed, soak in a pot of water, then drain and dry with a towel. Using a sharp knife, cut Brussels sprouts into thin slices. Alternatively, use a food processor to shred. Heat a pan to medium, then add in sliced blanched almonds and lightly toast until golden brown. Remove from pan and set aside to cool, then to the same pan, add bacon and cook until crispy. Remove from pan and set aside. Pour water in a small pot, add an egg and slowly bring to a boil. Cook until hard-boiled, about 7 minutes, then remove from water, cool, peel and slice into thin slices. 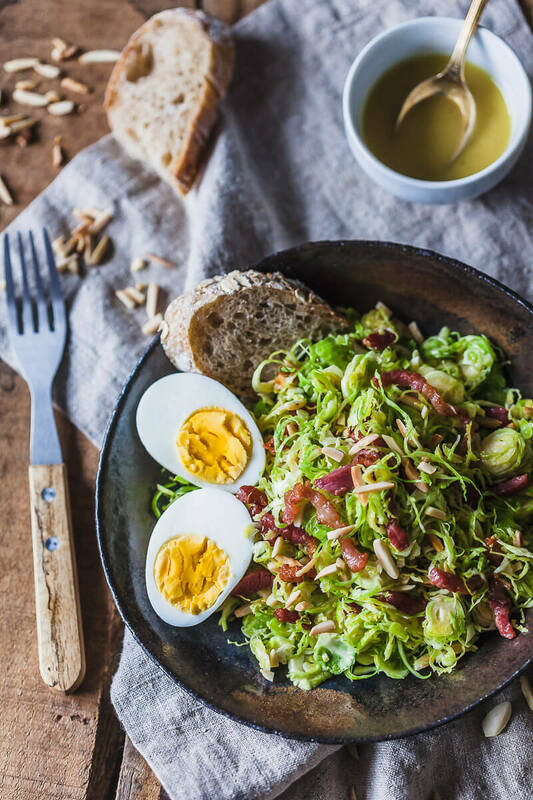 Place sliced Brussels sprouts into a salad bowl, add almonds, bacon and sliced egg. For the dressing: Place ingredients in a bowl and whisk together with a whisk until thoroughly combined. Pour salad dressing over salad, dress and mix together, then serve.